Because the managed honey bees (commercial European honey bees) are declining in numbers, it is very beneficial to create a bee garden for both native bees and feral (wild) honey bees. There are nearly 5,000 species of bees in the U.S and most of them do not swarm. They are gentle little creatures who lead solitary lives and nest underground or in dead trees or in pithy stems. The greatest need of these benevolent little beings is undisturbed nesting sites free from pesticides. Bees also need sources of water which can be provided from a dripping faucet, pond, stream, fountain or birdbath. Some, like the blue orchard bee, require mud as a building material for their nests. Thus feral or native bees need nectar, pollen, water, nesting materials and open ground. So go ahead and tear up a bit of your lawn and plant wild flowers along the fence line, leaving an area that you do not tidy up so the ground dwelling bees have safe refuge. 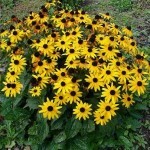 Use a wide variety of native annual and perennial wildflowers which naturally grow in your region, such as Cosmos, black-eyed Susans, Echinacea and Lavender and herbs like rosemary, marjoram and mint. 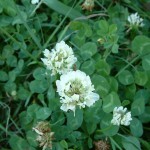 Honey bees love clover and it is extremely nutritious for them. Bumblebees thrive on blueberry blossoms. 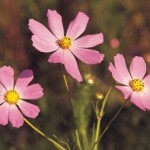 Select the best bee-rewarding plants and you will also attract butterflies and hummingbirds to your flower and vegetable gardens or backyard fruit orchard. 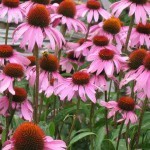 Echinacea – Not just for humans! 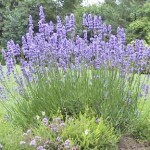 Lavender – Beautiful, naturally relaxing, and bees love it!